Let's face it, when you want to travel safely with your jewelry, you want to keep it on your person. Risking your precious pieces of jewelry in your checked luggage is just asking for trouble.Nothing worse than trying to detangle jewelry that's become hopelessly clumped together in a barely useful travel pouch. Actually, there is something worse...lost or stolen jewelry! This elegant travel jewelry case banishes those worries and fears with style and functional flair! Excellent as a gift for that special someone, including yourself,This travel jewelry case covers all the bases in fine style. It's the perfect the answer to all of those small jewelry pieces that seem filled with the intent to be lost. from the perfect design, to the right sizing to fit into your purse and carry-on luggage, we've thought of everything. 1).Stay organized and look professional. 2).Big storage but small size and very compact. 3).Folds flat or rolls up to take as little storage space as possible in your bags. -Material:Created from vegan leather+Velvet interior. -Size: 8.26"×6.29"inch,Big storage but small size. -Package Including: 1 X jewelry case. --Jewelry shown for reference only; it is NOT included. --GIVE YOU 100% SATISFACTION - Any problem,please email me freely .your trust is our support,we will wholeheartedly serve you. 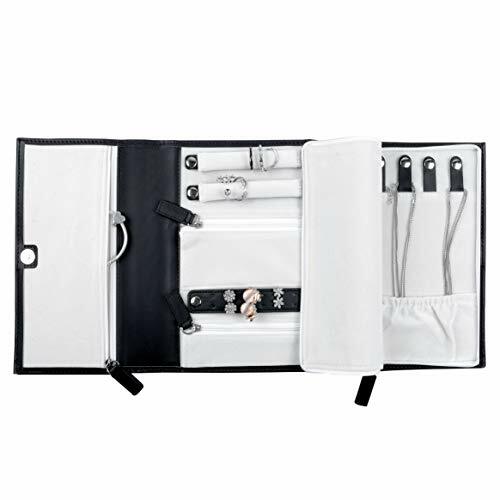 ❥PERFECT TRAVEL : Easily packed soft portable travel jewelry case that folds flat or rolls up to take as little storage space as possible in your bags, helps you store all of your most precious pieces in an orderly, safe manner. ❥SECURE DESIGN : Leather jewelry case made of velvet interior protects your valuable jewelry, Big storage and compact design, jewelry travel can hold necklace、earring 、ring ect. Clutch purse style,zippers close tightly keeping the contents safe, preventing any items from falling out. ❥FRIENDLY DESIGN : Absolutely no animals harmed for this black jewelry case,our faux leather design looks and feels like the genuine article.Specially sourced and designed lends an aesthetic of understated elegance. ❥PERFECT GIFT : This jewelry organizer is purpose built for petite, delicate pieces,.deal for taking on a weekend trip or longer vacation.it's perfect holiday gift idea for mom's, wives, girlfriends or sisters. ❥100% SATISFACTION : Any problem our jewelry bag , please email to our after-sale team on amazon,refund or a replacement a new jewelry travel bag, whichever you prefer. If you have any questions about this product by ONLVAN, contact us by completing and submitting the form below. If you are looking for a specif part number, please include it with your message.